Mt Cuerno 5200m seen from Aconcagua - Photo Gabriel Tarso. Edu chilling at restaurant after the trip - Photo Gabriel Tarso. 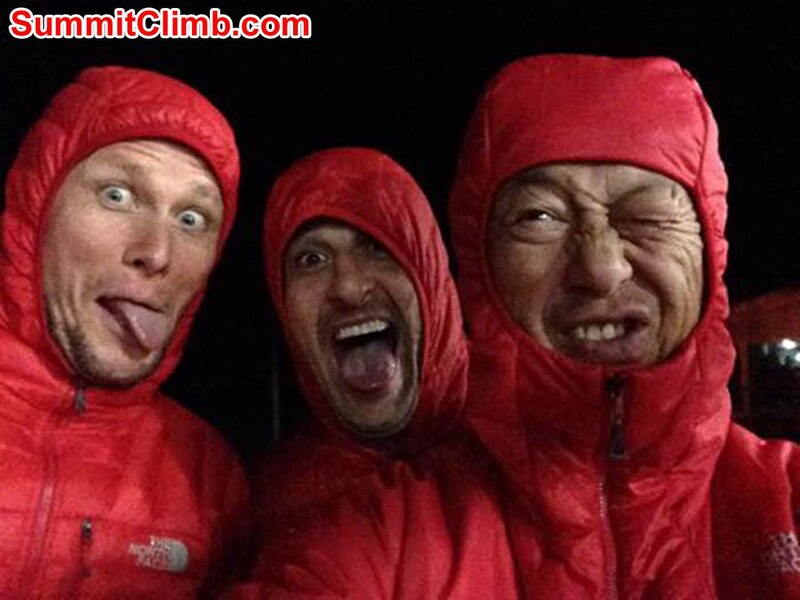 Update from Leader Max: Jan and another 7 members just summited!! 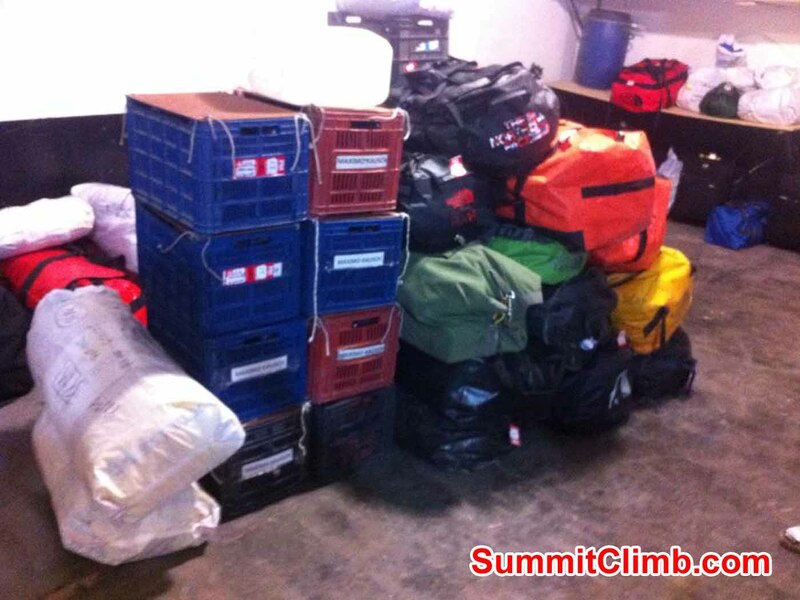 Update from Leader Max: Whole team @6000m c3 getting ready 4 summit! Cedric and Jan at 5000m - Photo Cedric Chamaillard. Cedric and the mules - Photo Cedric Chamaillard. Our whole team is doing very well at 3400m. Hi! 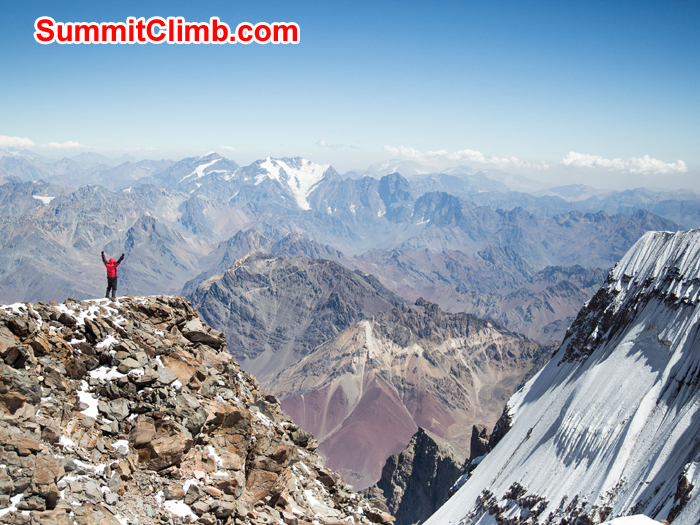 This is Max Kausch writing the first dispatch for the SummitClimb February 2015 Aconcagua Expedition. Today is a cloudy wednesday and most of our team is already in Mendoza! We're waiting for our last member who is arriving in 1 hour! 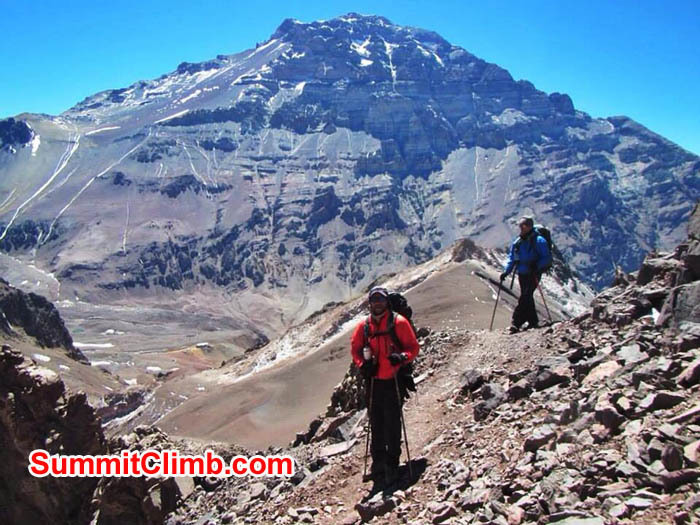 After 2 successful trips in a row (one being the first in 2015 and another with almost 10 expedition members on the summit), we start our third expedition to Aconcagua. This time we have a very mixed team from all over the world! 4 members from Brazil, 1 from Australia, 1 from Israel, 1 from US and 1 from France. At this time we have the presence of Ms Jan Smith from Australia. 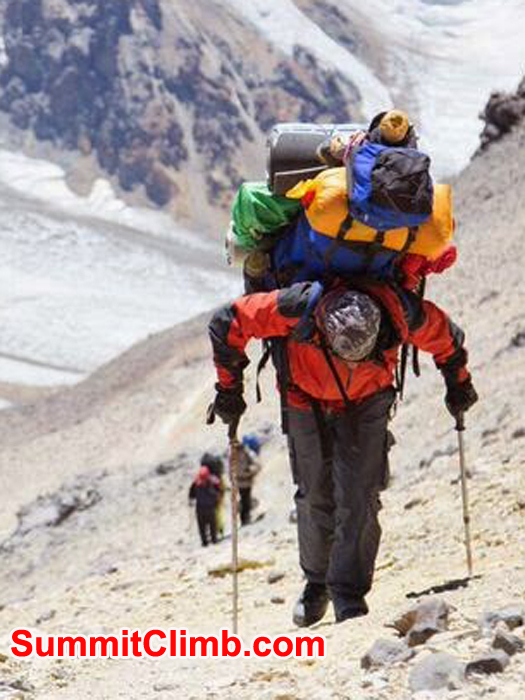 She's attempting to summit Aconcagua as her 6th summit out of the 7 highest in each continent. 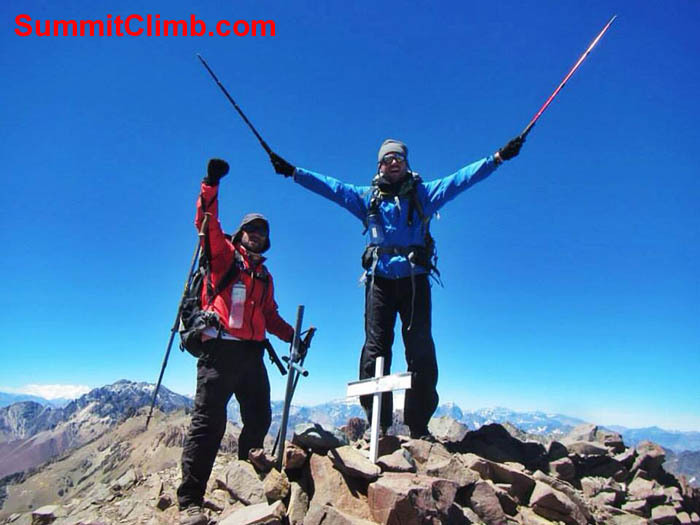 Jan is aiming to summit Aconcagua and then move to her next summit on the list, Mt McKinley. Ms Smith is 70 years old and we are very proud to have her in our team! 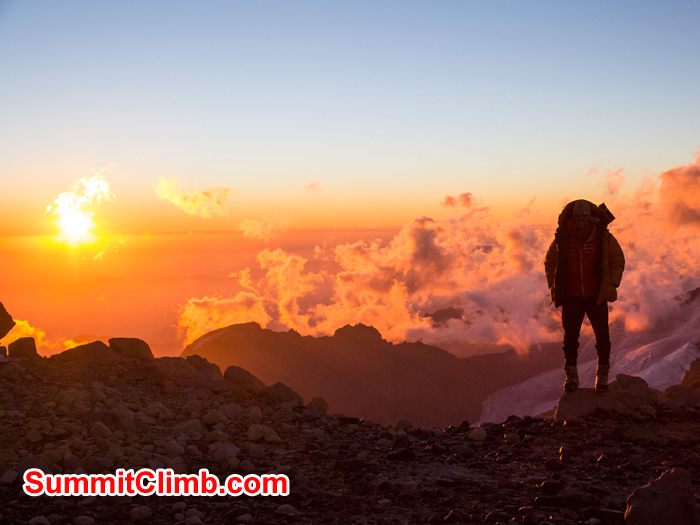 She's a 3 time veteran on SummitClimb expeditions! We also have Mr Ziller and Mr Tarso from Brazil who are shooting a documentary for the Brazilian TV. We hope to contribute and do our best so they can shoot their documentary smoothly. Bruno and Jorge at the Summit. Edu and Jorge, our 2 guides on the summit. Luciano, Fernando, Max, Vinicius and Jan on the Summit. Descent to BC. Huge storm system approaching. Jan at 6000m, camp 3 Colera. Our camp 3 at 6000m named camp Colera. Our team at the mountain gear shop. Sunset from 6600m. Sunset from Nido de Condores 5600m. Team resting at 5900m. Traverse at 6500m. Hi, This is Max Kausch writing from sunny Mendoza. Today is January 28th and we're back from the Summit! 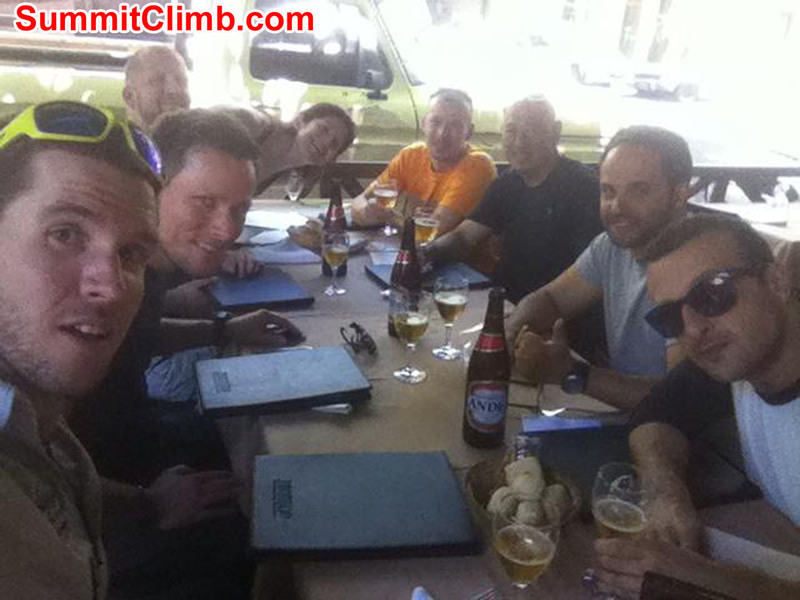 Our team split up in 3 and most of us summited on the 24th at 14:30, 15:45 and 16:00. 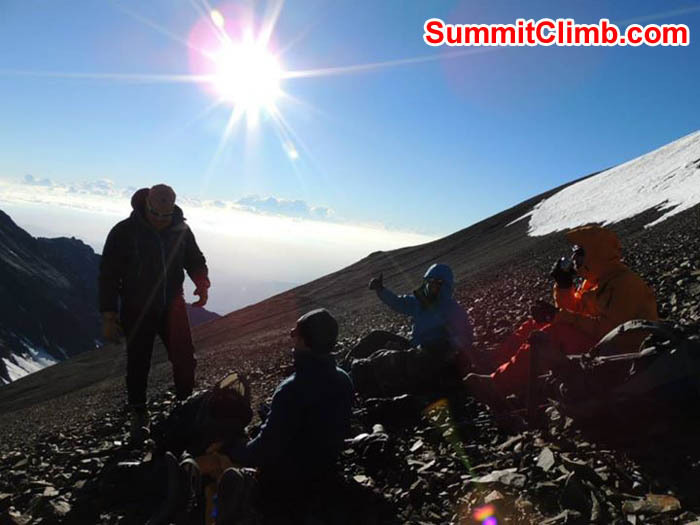 In total, 5 members and 3 guides reached the summit. The weather was perfect thanks to the day the chose based on our weather forecasting system which we receive several times per day on our satellite phone. We're now preparing the next trip to Aconcagua which starts on Feb 3rd. We summited yesterday! We had 8 members and 2 guides on the summit! We're at camp 3 at 6000m getting ready for the summit! The plan is to leave at 3am. Everyone acclimatised well. We look forward 4 tomorrow. Arno Britz enjoying some music at 5050m - Photo Maximo Kausch. Our team on the way to camp 1 - Photo Roberto Mendonça. Part of the team at camp 1 5050m - Photo Roberto Mendonça. Team on the way to camp 1 - Photo Maximo Kausch. Hi there, This is Max Kausch writing a dispatch for the Aconcagua SummitClimb January Expedition 2015. We´re all very well at Plaza de Mulas 4300m and today is January 19th 2015. Hi there! This is Max Kausch writing a dispatch for the SummitClimb January Aconcagua expedition. 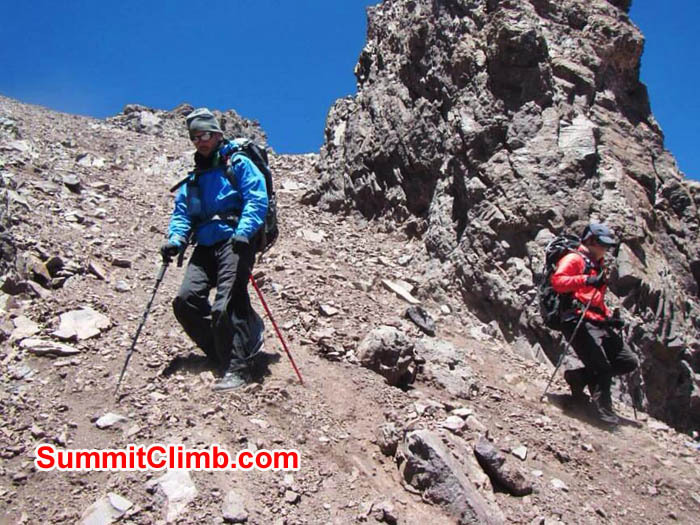 We´re acclimatising and very well at Plaza de Mulas, Aconcagua´s basecamp 4300m high. Today is January 17th and our rest day. All the 16 expedition members are acclimatising very well and we all look forward to move up the mountain. We went to the base of the south face on the 15th and took amazing photos. 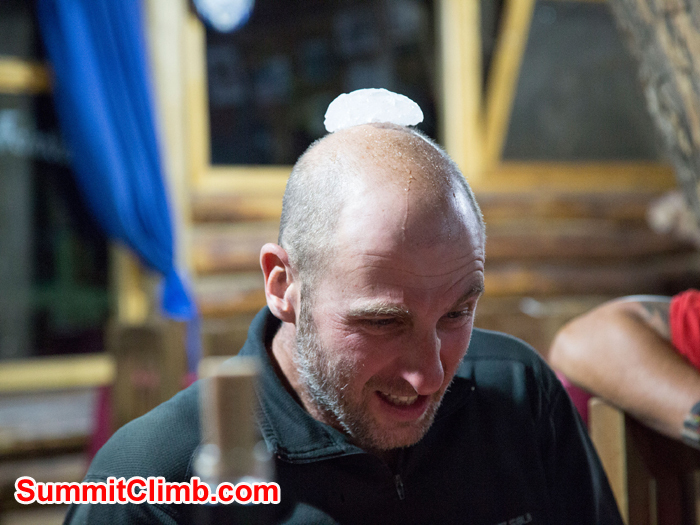 That really helped on the acclimatisation as the human body produces red cells based on the altitude we spent most of the day. We´ll start setting higher camps tomorrow. 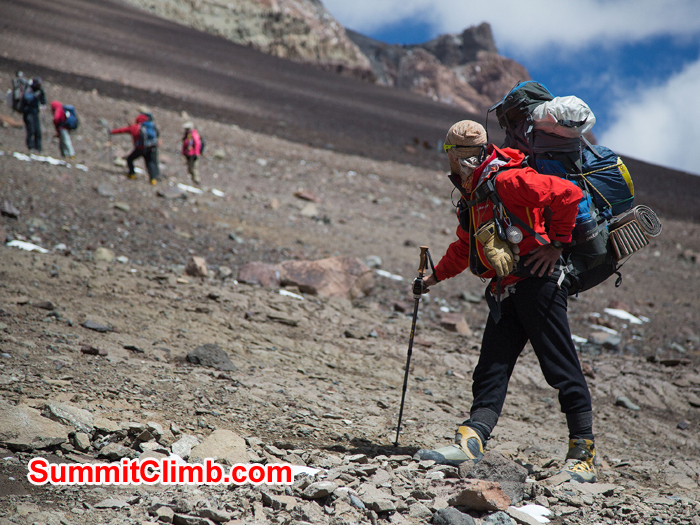 Thank you for following the blog at SummitClimb.com. Summit of Aconcagua. Summit of Bonete. Hi there, This is Max Kausch writing a dispatch from the sunny Mendoza. Today is January 5th 2014 and we’re just back from the summit! 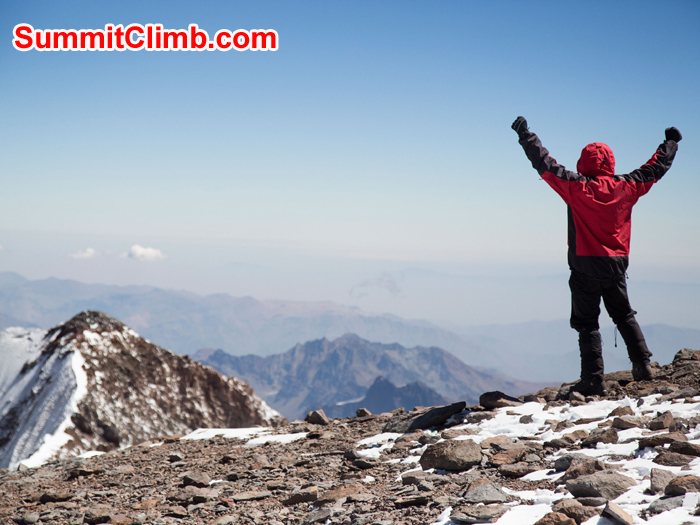 A total of 5 out of 10 people have made it to the summit on January 3rd. After a 5 day wait at camp 2, we really insisted and finally had the pay off. Our first day at camp 2 was on December 28th, this is when we noticed a huge change on weather and also on weather forecast. Our team agreed to wait so we stayed there for another 4 nights before moving to camp 3 at 6000m. On new years day camp 2 was completely empty apart from our tents. New year’s eve was extremely windy and 2 of our tents actually broke. We spent NY eve holding the tents together! We wind gusts went up to 90km/h! At the end it payed off as the wind dropped on January 2nd. This is when we moved to C3 and pushed for the summit next day. We left the tents at 5am and made it to the summit at 12:30pm. The path was very snowy and we had to break trail on the way up. 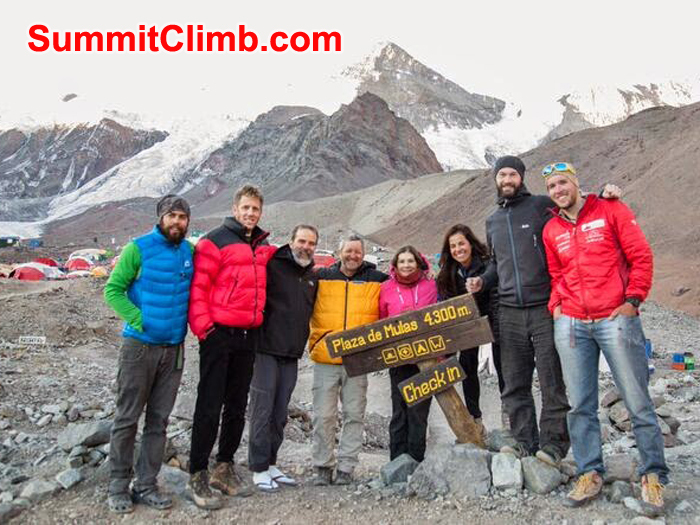 On the summit, big surprise: we were the 1st team in 2015 to conquer the summit of Aconcagua! We’re now preparing our next trip to Aconcagua, this time with 14 clients! Wish us luck! for life. Three days later I am at her funeral in Chicago so lucky to have made it. lesson was how precious life is and not to waste a single day. Its a sin to waste the gifts God has given you I have been blessed to be able to do this. Made me appreciate simple things again Toilette, bed, shower, real food. for the early morning wake up call. one big pile while the tents get made. I only carried 15 lps now water, food, emergency gear and pack, wearing most of my gear. my double plastic boots are very uncomfortable but came in useful in the steep rocky part of the climb, I could hang a toe in a rock and step up a few blisters but feet in good shape. ended up trading and eat part of our 1200 calorie meal which would be it for the day. maybe sleeping 15 minutes every hour. I don't get out its cold but no wind. We get our wake up call my back is very stiff . Everyone is struggling it takes 30 minutes to dress. I ask for another rest day max tells me today is as good as I will see with the weather. Everyone feels bad but I have plenty of days left on my permit plus its not the altitude sickness as much as my back that needs a rest day. He agrees he has he has his hands full a film crew with equipment and Jans second push it will be just me and my guide Jorge on my summit day. with because ink freezes and doesn't work but not the Ipad. guide on the mountain so if we did get bad I have confidence he would get us off the mountain. impressed with their effort. The cause of death was high altitude cerebral embolism HACE. I watch our group return scattered and spent they go strait to the tent and crash in their clothes. out of food. I don't like the call but not thinking clearly and looking back was the right move. I can see it in my rambling journal that i wrote the past 5 days. am getting top heavy I fall with the weight a lot. the worst job of the group is the porters load the now frozen poop bags to carry them down for disposal. met with hot pizza in a dome tent the first time we get to talk to each other about the events. the malbec and steak were calling my name. writing form camp 2 'nido de condores' (nest of condors) 18600 ft 5500 meters -7c storm getting better. I could have gone on with bad news, sorry lost track of time from now on will post by song and post number and where I am at. After you get to camp there is a lot of work to get set up for the next day. What to wear, how heavy, snow slowed things but max and guys built a special green tent 3 rocks, garbage bags, air fresh and tp. We were shown how to use rock paper sanitizer, unfortunately I became the expert, by the end of the night I am sick to my stomach only warm place is in your bag. I crawled in and out all night to poop tent freezing, not sleeping dehydrating all night. I found out many other teams came down with the same problem and all food was service stopped. I felt sorry for Roi getting woke every hour by me but he was worried also. The ascents to higher camps start quickly from here up we move up again to "nido de condores" nido is over 18000ft we will have a rest day here and I need it. Roi ran ahead of the group and got here one hour before anyone else and helped set up tents he was carrying 50 lbs. I crawl into ours and crash very tiered, Jan makes a tent call she brings me electrolytes, pro biotic, and encouragement that i will get better soon. Each change in alt makes big temp change we left our vent closed and at 6 am a rescue helicopter flew over dislodging ice frozen to roof of the tent, on us. We have 2 days her then 2 nights at camp 3 Colera 20,000 ft. The summit gets closer by the day. Roi comes to the tent sun has warmed above freezing inside, outside is a different story. He went for a walk and told me about the sun set where you can see the top of the Andes and he found a rock throne to sit on above the glacier. I finally got some sleep no apnea felt good and I venture out with a thermos of lemon tea and camera to find Roi's throne. I find it about 1/4 mile from camp he was right I sit on the throne and thank god I am here. It has been a good day. 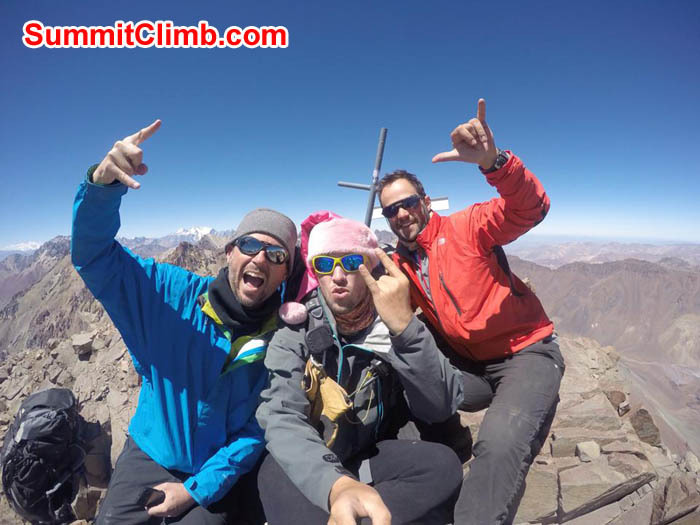 Aconcagua team very well@camp2 5650m tx Max. Matthias flying up the montain, literally - Photo Diamon Pon. Merry Christmas at 4300m - Photo Diamon Pon. Mr Miaghi at BC - Photo Marcos Engel. Oops! Problem on Paulo´s tooth - Photo Matthias Muller. Rodolfo, Max and Marcos at the summit of Bonete - Photo Maximo Kausch. Hi there, This is Max Kausch writing a dispatch for the December SummitClimb Aconcagua Expedition. 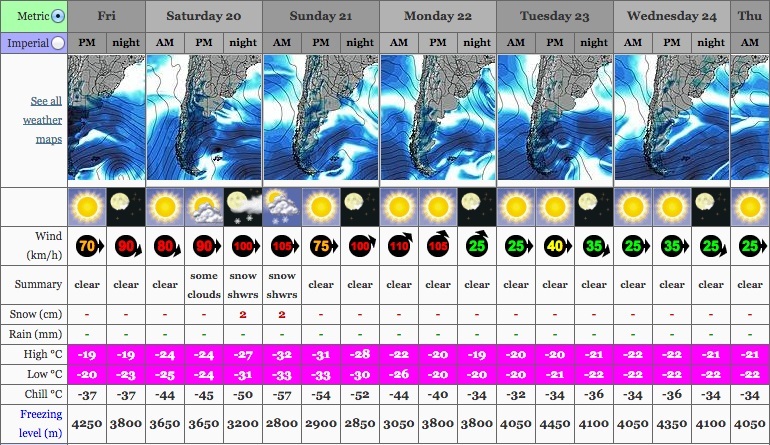 Today is december 27th and we´re all fine at BC 4300m. We´re at BC getting prepared for our summit push on the 01st of january. Weather forecast looks good for the 01st so we start moving up the mountain tomorrow. We had an extra day at BC today so we can try the summit on the 01st. 3 of us went to a 5050m summit named Bonete. This really helped on the acclimatisation! The team is doing very well and we all look forward for the summit push! Approach to Plaza de Mulas - Photo Diamon Pon. Our mules on the way to BC - Photo Maximo Kausch. Our lunch table at 4300m - Photo Maximo Kausch. Our team at the start of the approach - Photo Diamon Pon. This is Max Kausch writing a dispatch for the December SummitClimb.com expedition to Aconcagua. Today is Christmas eve and we´re at BC 4300m high. All expedition members are doing great and having fun! Today is our rest day and we´ll relax here at BC. Weather improved a lot and it seems we might have 5 days of decent weather. I hope this is enough time to acclimatise and be ready for a nice summit window. The approach went very well and we made it to BC in 7 hours. Today Dr Muller is teaching us some german card games and Mr Diamon Pon tried to teach the team some taichi moves. We´ll start to move up the mountain tomorrow and take our first load to 5000m. Wish us luck! 1st lunch together - missing rodolfo and herman on the picture - Photo Max Kausch. half ton. Team having fun. Photo Max. This is Max Kausch writing a dispatch for the december Aconcagua Expedition. We are currently in Mendoza and all members are fine! The whole team is finally together in Mendoza. All members have already arrived and are now enjoying the city very much. Everything is already packed and ready for the 30 mile journey on mules to basecamp. Our team will leave Mendoza tomorrow at 2pm and will sleep the 1st altitude night at 2700m in a small town named Penitentes. Our walk start actually on december 21st and the 1st day is very short. Aconcagua is very dry this season! High winds are currently blowing very fast up the higher slopes in Aconcagua but there is no snow due to a phenomenon named Zonda Winds. Such winds melt down all the snow available on the mountain leaving us with almost nothing to melt. As always we expect one storm late december to dump a lot snow and giving us something to melt. Right now everyone will only focus on getting to BC and from there on we’ll figure out what the conditions are. Today we had our 1st meeting and discussed every aspect of the expedition including our summit strategy. 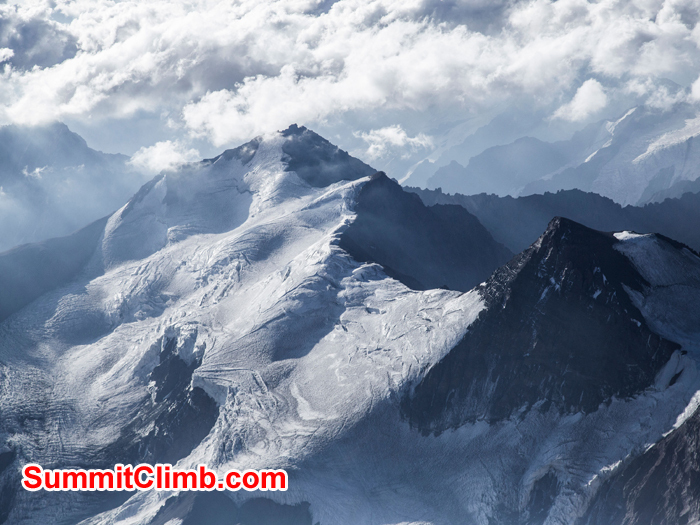 We at SummitClimb don’t give up the summit and will keep pushing and pushing when possible. Lat year we had a very successful december expedition getting 9 out of 11 people to the summit. We hope to repeat that!